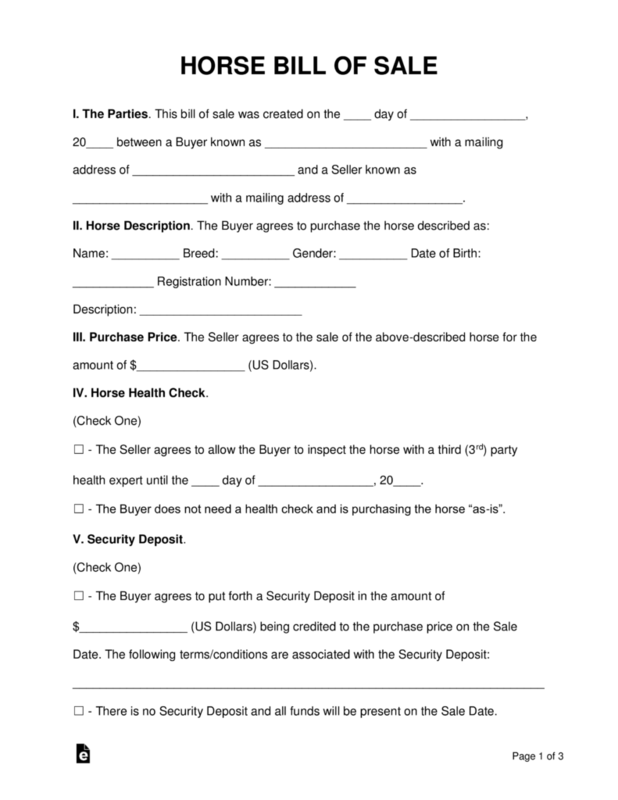 The Horse Bill of Sale, or ‘equine’ is a legal document that details a transaction between two (2) parties with regard to the purchase/sale and therefore, change of ownership of a horse. Should the animal require a health examination, prior to a complete purchase, it’s likely that a deposit will be required. Should the parties move forward with the sale of the animal, the deposit amount will be deducted from the balance due. 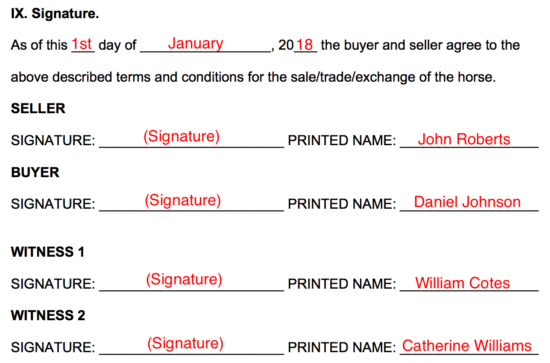 When Should I Use a Horse Bill of Sale? Anytime you plan on selling, buying, or transferring ownership of a horse from one person to another, you will need a Horse Bill of Sale. This sales document is important in detailing everything related to the purchase and transfer. This is a legally binding document. In fact, you’ll need this document if there is ever a dispute about who is the true owner of the horse, or if questions come up about its lineage. How Do I Go About Buying a Horse? Owning a horse is a huge personal responsibility. They’re costly and require lots of knowledge and experience. But if you’re ready for the responsibility, or if you’re an experienced owner adding to your herd, follow the steps below. Are you a horse breeder, a rancher, or looking for a horse to show in a particular discipline? Or are you just looking for a family horse for the kids? There are a lot of different horses out there and it’s important to know which kind of horse you want to buy. If this is your first time buying a horse, it may be best to start off with a calm, well-trained horse. Be sure to consult with an experienced horse person to figure out your needs. If you’re planning to breed or use the horse for showing or sports, you hopefully already know everything you need to know, but it’s always a good idea to do your research and consult with experienced individuals. Horses need a large space, a sturdy fence, shelter, a lot of food, and plenty of care. All of this can be very taxing on your finances if you aren’t ready for it. So before you buy, work out a budget figuring in costs of food, tack, vet costs, boarding, and everything else you’ll need. If you’re ready to buy a horse, then look for sellers from people you might know, breeders, ads, or auctions. 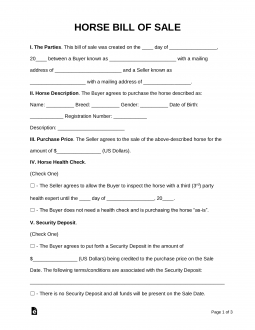 Verify the credibility of the seller and ask lots of questions about the horse. Chances are, if the seller’s record is clear and they’re knowledgeable about the horse, they’re a trustworthy seller. It’s important to see the horse firsthand before you buy. Watch the owner handle the horse, handle it yourself, and ride it if possible. Ask about its history, if it has any injuries or health issues and if there is anything else you should know about it. Get a vet out to check its health, too. It’s also a great idea to take an experienced friend or trainer along. You’ll want to see the horse a few different times to ensure that it’s in good health and the right fit for you. If possible, ask the seller if you can take the horse home on trial. Most will agree and you’ll be able to make sure it’s the right fit for you. When you’re confident this is the horse you want, then it’s time to negotiate a price. Put it in writing once an agreement is made. You’ll also want to put down a good faith deposit to show you’re serious about the purchase. It’s always best to have a vet give a physical of the horse and make sure it doesn’t have any problems before you purchase. With a Horse Bill of Sale, sales are as-is. You don’t want to spend good money on an unsound horse. 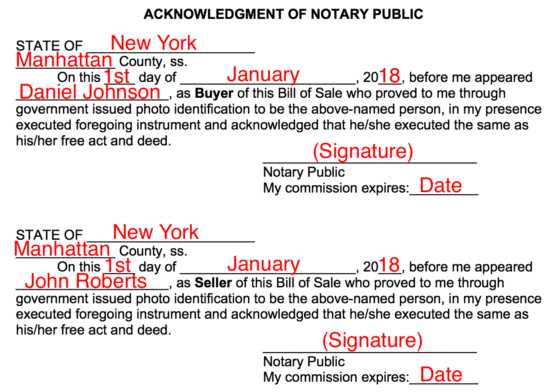 Once everything is set in writing and the price is paid, you’ll just need to have a public notary make it official and to secure the sale against any potential fraud. You can usually find a public notary at your local or county offices. Congratulations—you’re the new owner of a horse! As the document is completed and the signing parties have provided identification, the notary will provide their required information and acknowledgment.